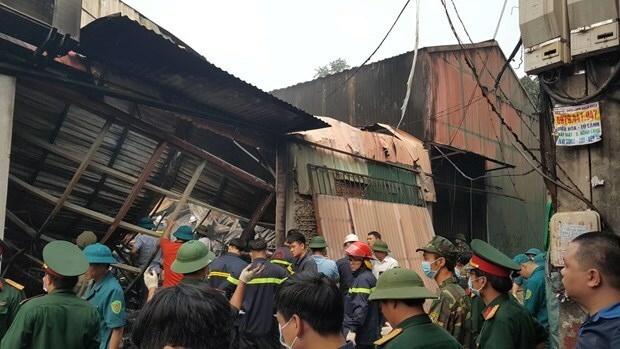 Hanoi (VNA) – Permanent Deputy Prime Minister Truong Hoa Binh has asked the Ministry of Public Security and Hanoi’s People’s Committee to instruct relevant agencies to clarify the cause of the blaze that ravaged workshops in Hanoi and killed eight people on the morning of April 12. He said violations must be handled stringently in accordance with law. On behalf of the Prime Minister, he sent condolences to families of the deceased and requested Hanoi take prompt assistance for the deceased and injured and address the consequences of the blaze. Also on April 12, Hanoi’s police launched legal proceeding against the blaze case for violating regulations on fire prevention and fighting in conformity with article 313 of the Penal Code for conducting investigations into the cause of the inferno. A fire broke out at around 2:30am on April 12 in a small alley in Trung Van ward, in Nam Tu Liem district, Hanoi, destroying four workshops in a 1,000 sq.m complex, and taking the lives of eight people. Firefighters were dispatched to the scene, however, the complex is located deep in a residential area and contains flammable materials like wood and plastic products that fuelled the fire and quickly destroyed all four workshops. At about 7:00 am of the day, the fire was completely extinguished.